A surprisingly stellar review for an appliance from a brand that normally doesn't manufacture slow cookers. Normally we see reviews of slow cookers from typical brands like Hamilton Beach, Crock-Pot, or even West Bend or Cuisinart. Anyway, it turned out to be a really well-designed product that cooked just as well as any other similar device. At a slightly higher price point than others, it's not for everyone. But it is for every kitchen, and the high quality stainless steel will definitely match your current kitchen decor with an instant upgrade! A surprise review from Frigidaire! 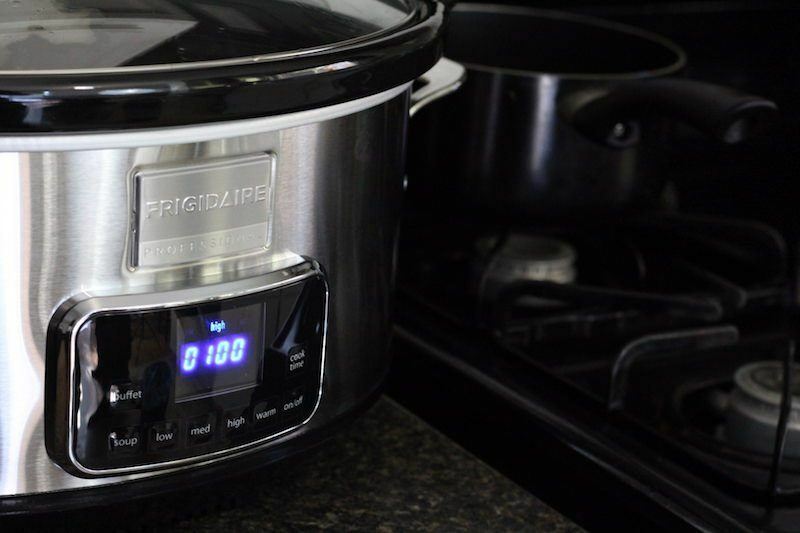 Today we're looking at the Frigidaire Professional stainless 7-quart programmable slow cooker. 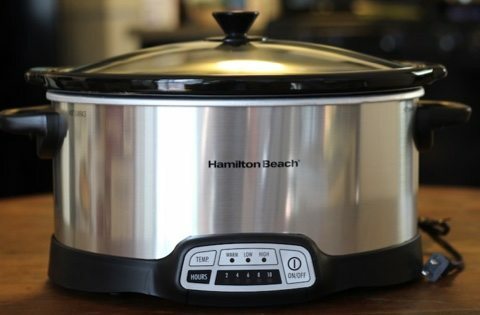 Usually I spend all of my time reviewing Hamilton Beach and Crock-Pot models because there are so many of them, but I like to branch out when possible and try some different brands to see how they compare. 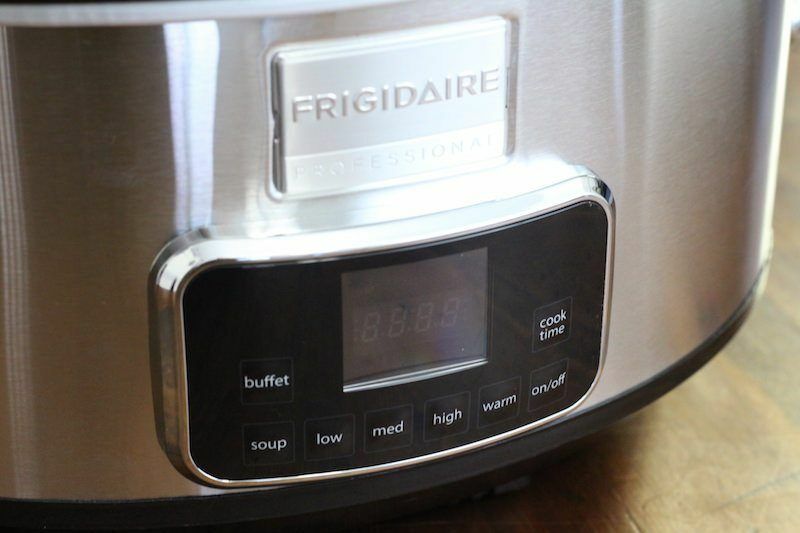 Surprisingly, I really liked this Frigidaire slow cooker! Mainly it's because it actually looks nice instead of looking like a bulky thing that your grandma has been using for 30 years. It does cost a it more than other similar sized appliances though, so let's also take a look at how it performed and and see if it's worth the cost. Slow cookers tend to not variate much when it comes to features, so with the Frigidaire 7-quart programmable device, you are going to at least get what you'd expect from any other cooker: low, medium, high, and warm settings. There are more settings than those, but we'll discuss that in the next section. You'll also get a dishwasher safe lid and crock that makes clean up easy. Because this is a programmable slow cooker, all features are dialed in with a push-button interface. You can set it to cook for as little as 30 minutes or as many as 12 hours. Because this is not a portable model, it does not come with a rubber seal around the lid or locking clips like you see in the Cook and Carry models or Stay or Go models. Actually, I prefer it like this because I'm not a fan of the rubber seals. Keep in mind, this is a 7 quart slow cooker, so it's a bit larger than the standard 6 quart size. 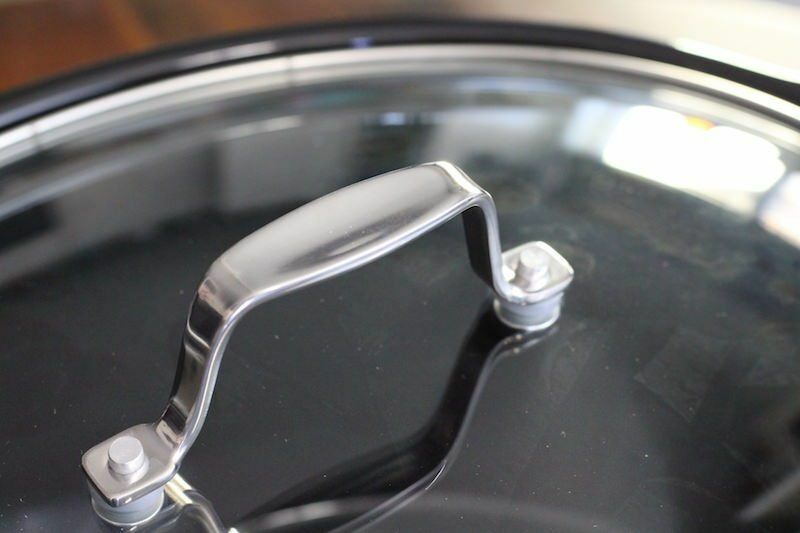 To start, one of the main strengths of this slow cooker is the unique design. If you are looking for a unique design, and do not want to be stuck with the same general model that everyone else has in their house, then you should seriously consider getting the Frigidaire Professional. For some folks, design doesn't mean for much, and price outweighs everything. That's perfectly reasonable and understandable. But after reviewing 50 slow cookers and making slow cooked meals a staple of my household, I have to look at this thing day in day out! Rather than hide it away in a cupboard when I'm not using it, I like to keep it on the counter and look at it as I walk by. The only other appliance so far that I liked better than this one in terms of design was the Crock-Pot 6.5 quart programmable touchscreen. The chrome finish may be a bit too shiny for some people, but I loved it. Just after opening the package, I knew this was a unique slow cooker so I even spent time to take pictures of the carrying handles and lid handle. I knew I'd be talking about them in the review. 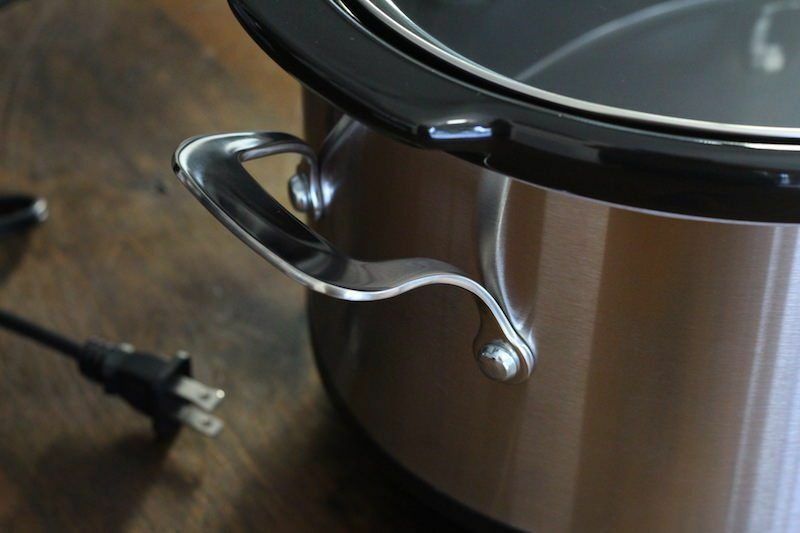 One reviewer (see below) complained of the handles being too close to the pot. I totally disagree. Unless you have a pot with gigantic handles like the Set ‘n Forget from Hamilton Beach, most slow cookers come with this size handle. In fact, they have holes in them for getting a strong grip. Some models like the Gourmia 8.5 quart only have little plastic pieces which work but are not as functional as the Frigidaire Style. I do agree that some kind of silicon grip might be helpful, but even then, those can get hot too. In addition to a cool look, there are some functional additions worth talking about. On top of the standard warm/low/high settings, you also have a medium cooking setting. Most slow cooker recipes require a low or high setting, so what's medium for? I think it's a cool feature because every cooker is different, and every recipe needs to be tweaked for your device. Adding meal size as a variable, you've really got to experiment with different temperatures and times to get a recipe right. A medium setting just gives you more options to get your recipes perfect. There's also a “buffet” setting which is like warm but a slightly higher temperature. This way you can serve food while keeping it hot but not overcooking it. The only feature I find a bit funny is the “soup” setting which is basically a 4-hour setting for high. I guess it makes sense to just pop some broth, meat, and potatoes in there and hit soup for an easy meal. I'm not sure this is a totally necessary function though, or perhaps they just needed an extra button to balance things out with the placement of buttons. Though this is just a promotional video, it still gives you a bit more information about this cooker, and some high quality video so you can see how nice this thing looks. I made a very quick recipe with the Frigidaire Professional 7-quart slow cooker, so I'll have to test a longer one next time. I'll definitely be using this one again, so I'll update with the second recipe when it's done. This time around however, I cooked a slow cooker beef enchilada casserole. It was basically a layered lasagna using enchilada ingredients. It turned out delicious! It cooked on high for one hour. Everything was properly cooked as expected, and not overdone. When it comes to large slow cookers, you can't beat the size and design of model FPCP07D7MS from Frigidaire. Some big boys, like the Gourmia 8.5 quart are so big that they tower over other appliances in your kitchen. Even the Hamilton Beach 7 quart looks quite bulky. This has a very sleek design for it's large size (standard size is about 5-6 quarts). However, price-wise, you can get much cheaper. In the video below he quotes it at around 99 dollars but the video is about 2 years old. The price now is around about twenty dollars cheaper, depending on where you get it from. Still, there are 7 quart slow cookers that are programmable and have equally good functions. If you go real budget and skip the programming and automatic warming, you can even get some inexpensive 7-quart cookers for cheaper. Here's an interesting video reviewing this appliance. I don't agree with everything he says in the review, namely that the buffet feature is not that useful, and that the handles are too close to the pot. Maybe I'm just a pro at carrying slow cookers after reviewing so many, but I didn't have any issues and carried the cooker after setting it on high for an hour. Regarding pricing, I'm at the point where I'd rather spend an extra bit of money for a device that will last a few years rather than go with the cheapest of the cheap. I realize that's not an option for everyone but that's how I shop. I'd rather buy something I really like all around rather than just base it on price. For that reason, I've chose the Frigidaire 7-quart programmable slow cooker as my #1 choice for 7+ quart slow cookers. The #2 ranking was an equally good appliance that also did very well on design, but it was just too large for most kitchens. My third choice was the cheapest of the bunch, and comes from the reliable brand Hamilton Beach. It's about 1/2 the cost of Frigidaire and comes with preset cooking times between 2 and 10 hours. Note: On the frigidaire website it's listed for 99 dollars but you can get it for cheaper on Amazon. Also for some reason, the Amazon page is listing the old model as the newer one. Don't be fooled. The digital version (shown here) is the new one. The manual dial one is the old one. Who Is The Frigidaire Professional Stainless 7-Quart Programmable Slow Cooker Best For? This is a great appliance for someone that cares about what their cooking devices look like. If you have stainless steel appliances for your kitchen, then a matching stainless steel slow cooker makes sense. Even if you're not matching exact colors, stainless steel goes well with black, white, really anything else. It's got a very modern design that would feel most at home in a minimalist kitchen or a very tech-savvy home. 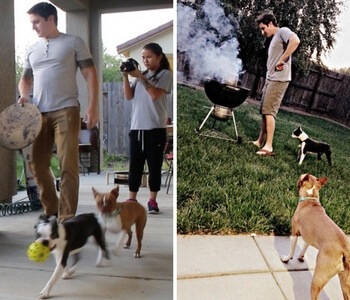 The large size lends itself to bigger families. If you are a single person I'd recommend something around the 4-quart range (nice designs in that post). For a meal prepper looking for something more budget friendly and pragmatic, check out the budget 7-quart cookers (linked above). 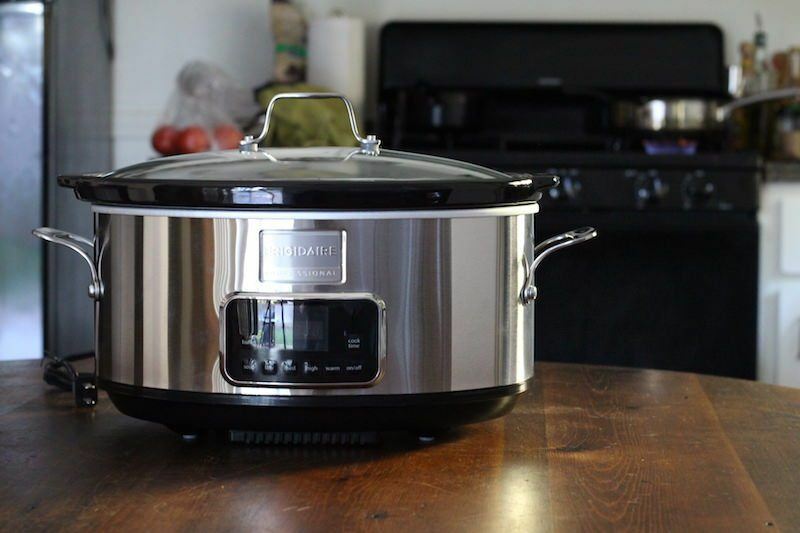 I really enjoyed using this slow cooker from Frigidaire and it was a surprise to me that they would seemingly put so much effort into designing a one-off product. They don't have other models in this lineup! Honestly, it kind of turned me on to the frigidaire brand. 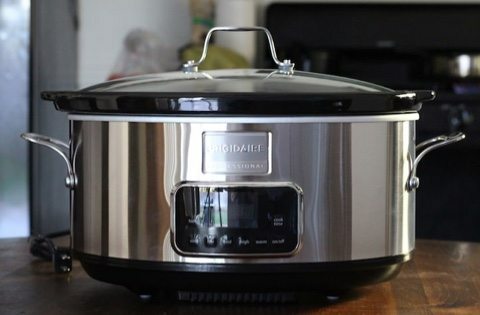 I have a mix-matched kitchen right now but as soon as I'm done writing this review I'm going to the Frigidaire website to see what else they sell and if it matches up with the slow cooker I wrote about here in this post. ==> Get The Frigidaire Professional 7-Quart Programmable Slow Cooker Here! Thank you for sharing your review about frigidaire professional stainless 7-quart programmable slow cooker. I have to point out, you really explain in detail everything we need to know about this cooker. I am a big fan of cooking and I will definitely consider to get one for myself. You’re welcome Karlo! It’s one of my favorites! I like to have beautiful kitchen equipment in my home, so there’s a reason that I love the Frigidaire model. If you do end up getting it, stop by again and let us know whether you love it or hate it! I love your review, to be honest, I thought Frigidaire as a brand has disappeared years ago. I am a good cook and I love everything related to kitchen, But these programmable machines do not interest me because I love to cook for my family. I may be mistaken but I have the impression that these machines try to replace us in the kitchen. Robots !!! Thanks for the review, was looking to upgrade to a bigger slow cooker as my old one is just too small to handle my big get-togethers. You sure help me narrow down my search with you thorough review, as you detailed important aspects. The handles both sides and top handles look plenty sturdy, and enjoy the settings as my current slow cooker doesn’t have soup, med, or warm settings. Great review. Yeah the 7-quart size is nice because it’s not as huge as an 8.5 quart, which is very, very large. But it’s still bigger than your standard 5-6 quart size which you find most homes. As a person who cooks in a slow cooker three to five times a week, the Frigidaire model has some very useful features. At the present time I have the Hamilton Beach Stainless Steel 7 qt. model. When I need to upgrade the Frigidaire model will match my other big appliances in my kitchen. The buffet setting will keep things warm for holiday meals. My aunt likes to make her soup every two weeks or so, she could put her stuff in here instead of on the stove for several hours. I think the soup feature is a selling point for people that like to cook foods with a lot of vegetables like my aunt. The biggest problem I have found with the slow cookers is that it makes my under cabinet lighting life short if placed too close while cooking. Have you ever had this problem. Ah yes, I have seen that happen with the under-cabinet lining before. It’s probably due to the steam being released. Over a long period of time the hot water vapor can affect the cabinet materials, impregnating it with water or heating away cabinet finishes! Wow, I didn’t know there were so many different types of slow cookers! I do have one, and I love using it. But this slow cooker really appeals to me. I really like that there’s a buffet setting which can be really handy when entertaining guests. I also like how you can set the timer for up to 12 hours, which would be handy for someone like me who is gone during the day for 10 hours, and would like to come home to my dinner finished. (excuse my ignorance if this is a setting on other models). I think I’m going to head over to your recipes and see what delicious meals I can cook up this weekend. Thanks for sharing!! The 12-hour setting is perfect for someone that works a long day. Technically, with non-programmable versions, you can just let them run forever, but your food will overcook if you leave it too long! 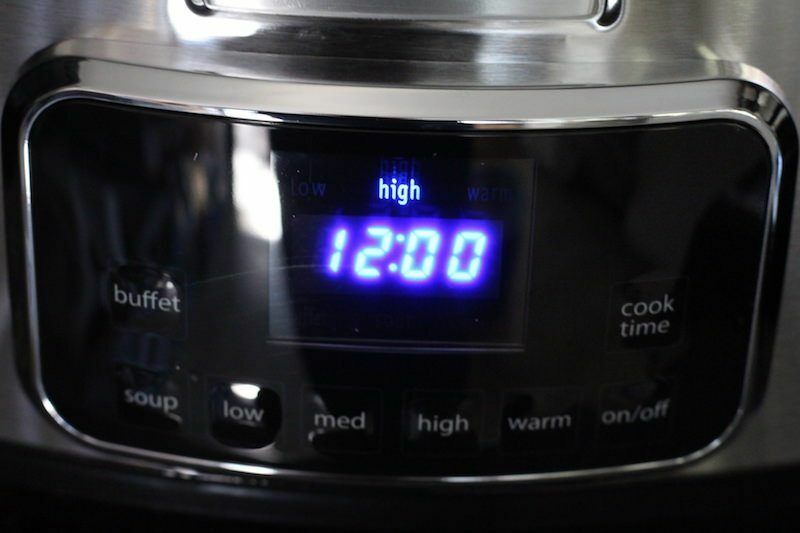 With the programmable types, you can set it to your desired time, then it will automatically switch to “warm” mode, which will keep it hot, but stop it from overcooking. Wow. Never thought that a slow cooker can be so sophisticated. I thought every slow cooker is just like mine. Put all the cooking ingredients and set the temp to high. 10 hours later the cooking will be done. I think I need to start looking for a professional programmable slow cooker. A Frigidaire will be on the list to check. Do you recommend me to get a regular 6 quart or this 7 quart? My goodness!!! What a review and the images are just perfect!!! My refrigerator is a Frigidaire, so I know from first-hand experience, about the quality of that brand. But I never knew they made crock pots!! It’s funny that I’m reading this now because just about a week ago, I was thinking about my own crock pot, and how it may be time for an upgrade. You mentioned about not being a fan of rubber seals, I would be curious to know why. This is definitely NOT your grandma’s crock pot! Great review, Nathaniell. Thank you! O’m not a fan of the rubber seals because they absorb a lot of flavors and need to be replaced over time. If you cook a lot, you may find that the seal doesn’t hold up well over time. What I Love about this slow cooker is that it has more settings. I am used to Off, On, Low, Med, and High. The fact that I can cook in 30mins or 12 hours is exciting. 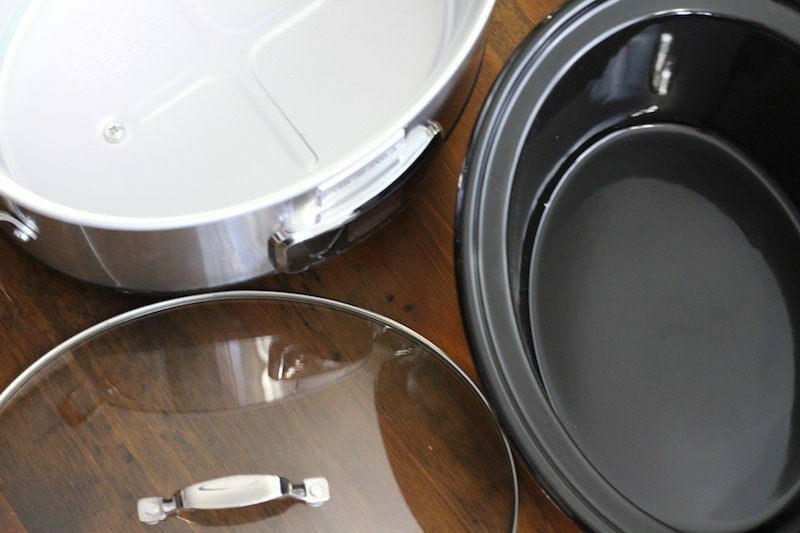 It also looks sturdier than the typical plastic top slow cookers. This item is no longer available on Amazon. Any suggestions on where to buy? 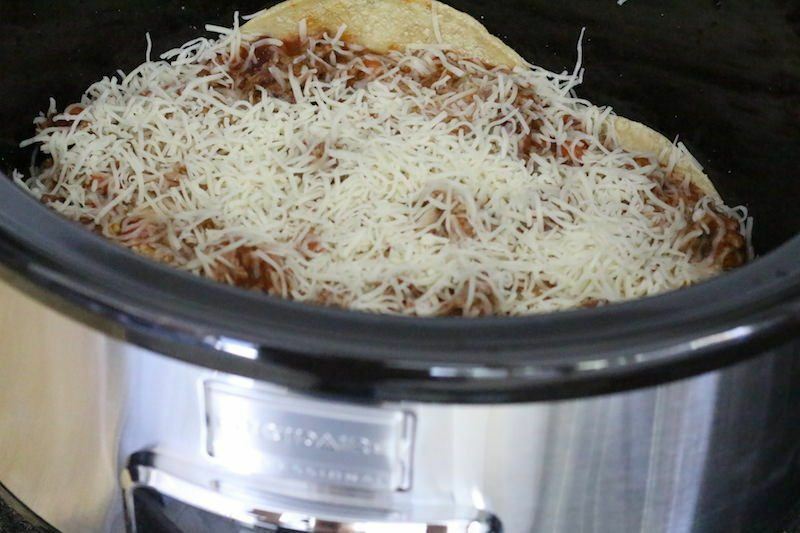 I love kitchen gadgets, so I love this Frigidaire slow cooker. What a nice option compared to the general crock pot. I like the sleek look. I like the stainless steel finish, would go great with my appliances. I also like the size and the buffet setting. I did click on the link to “Buy Now” and they are out of stock. I was slightly bummed as I couldn’t see the price either. You might see where else we can purchase this? Oh, that’s a bummer! Maybe you can get it from their website! So I would not underestimate the value of the appearance as you mentioned. My parents have one of the disgusting old looking slow cookers for our kitchen and I swear their parents cooked with the same machine. It looks old and gross even though the food that come out of it is delicious. So I think that my mom would be willing to pay slightly more for a machine that only looked slightly nicer which this one absolutely does. My question for you is when you talked about the 30 minutes to 12 hours cooking difference. So my cooker only offers as low as 4 hours of cooking. 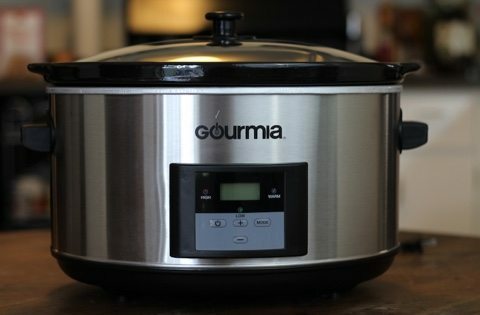 What types of things does this machine work well for when only cooking that short of time? I think she would be interesting in buying one if there were uses for her with meals she already makes on a regular basis versus maybe only hearing about new ones. Haha. That story sounds quite familiar. Maybe it was a bad idea to promote slow cookers on my website because it seems that everyone already has one and the last forever! I’ve never had problems with Hamilton Beach or Crock Pot, and so far, the frigidaire one is going really strong! One thing’s for sure, this sure is a pretty piece of equipment! I’d park it out in the open and look at it all day:) …whilst cooking something delicious of course! I really love slow cookers…wonderful to walk into the house after a long say out and smell the food cooking. Mine is a very old cooking crock I inherited from my mom – it’s brown and orange :(, but I love it for sentimental reasons! Certainly will look at this one when I’m ready to replace my old dinosaur! Hello Nathaniell, I really enjoyed your review for this slow cooker. You go over the spec of every minor detail and because of you I know probably even more than what I need to know about this product, and I’m not saying that’s a bad thing. I never have really gotten into the slow cooking scene, I always just grill it up or pan cook all my meats. I would consider it however, especially after this review. What do you like to do better? Grill or slow cook? From someone who has used many slow cookers in the past, I can attest to the importance of functionality, durability, cost and appearance. In my opinion, Frigidaire has proved it’s worthiness in the appliance market. I had a single-serving smoothie blender that far outlasted the other brands I had. And this slow cooker looks really good! You mentioned that, in your testing, the handles didn’t get that hot and that getting too close to the very hot exterior when grabbing the handles wasn’t an issue for you. But what about the overall weight of the appliance itself? Is the weight with and without food, manageable? I personally own a Crock-Pot slow cooker and am very happy with it. But I don’t think they are the leaders in the industry that they once used to be. It is interesting to see that Frigidaire has produced a slow cooker that is just as good. Not that there is too much to a slow cooker – slow, medium and high is pretty much the expected standard. My cooker broke some few days ago, but i can tell you, you’ve wet my appetite to buy one. This cooker has a very powerful features. The most lovely thing i love is that you will also get a dishwasher safe lid and crock that makes clean up easy. am really in love of the product. Coming across your review was definitely well-timed. I have used my slow cooker so much, I knew it was almost time to shop for a new one. The brand is well known & trusted I think -every Frigidaire product I have ever owned has been worth the $$.I personally like the soup setting, something I make often. Stainless is my favorite color, will match my stove & fridge. 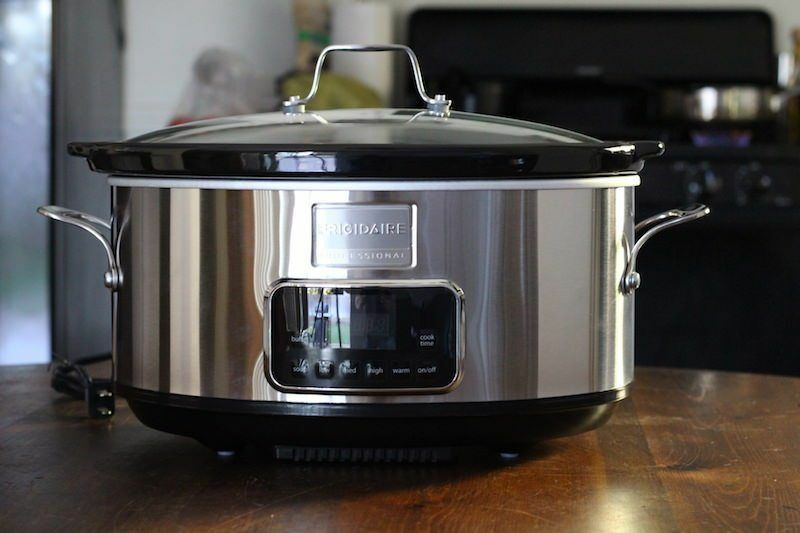 Beautiful slow cooker on your product review today, this slow cooker does sound just awesome and very reliable for cooking most anything you would want for your meals. My concern is this slow cooker is way too large for me, I am a single guy living alone does this product come in smaller sizes suitable for a single person living alone? If not, could you recommend a slow cooker good for someone like myself? Yes, I have a list of smaller slow cookers you can check out, or you can check out the review of my #1 pick for small slow cookers. 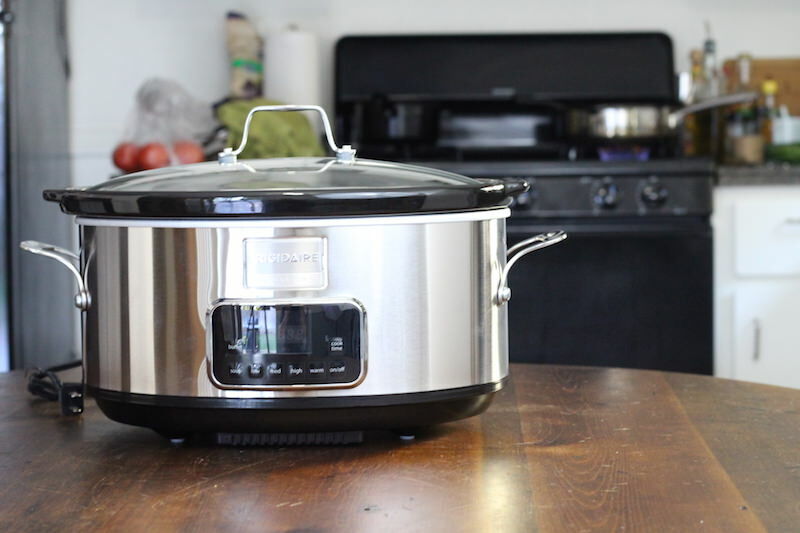 I never used a slow cooker before, the review is just good to be true and the review is very thorough as well, you laid out all the good stuff about it, I might consider getting one soon. I am a fan of your reviews and the website looks amazing. Thank you!